Preheat oven to 400°F. Grease muffin pan with cooking spray. Sift flour, cocoa powder, baking powder, sugar and salt into a big bowl. Stir in shredded coconut. Combine eggs, coconut milk, oil and golden rum in a medium bowl. Mix to blend well. Pour egg mixture to flour mixture. Fold together with a spatula until just combined. Spoon batter into muffin molds, about 1/3 full. 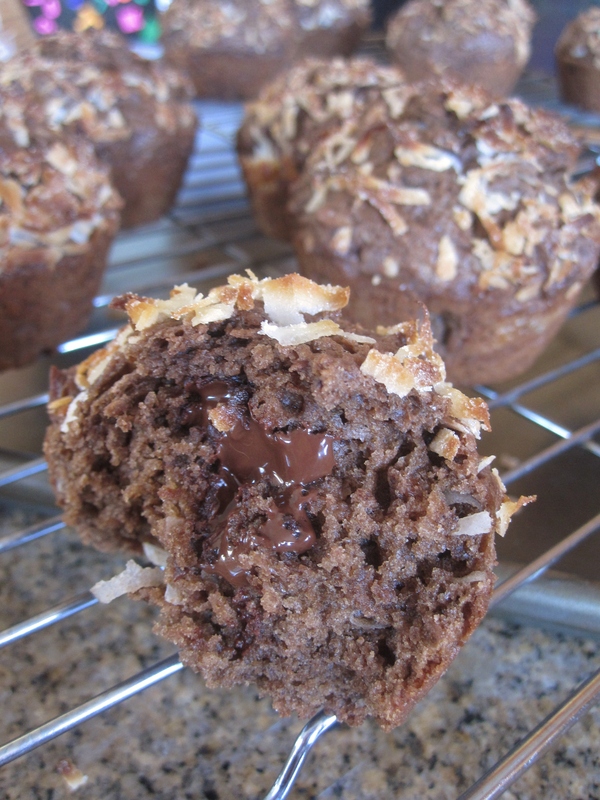 Add in chocolate chips (about 4-5 chips in each muffin mold), then cover with more batter. Sprinkle top with some shredded coconut. Bake at preheated oven for 18-20 minutes or until the tops spring back when gently pressed with a finger. Remove from muffin molds and cool on a rack. Serve warm. Baking time: I baked for 22 minutes but found out the muffins were a little dry. So maybe 18-20 minutes? Flavor: Full of chocolate flavor, not too sweet, but didn’t taste any rum nor coconut flavor other than from the topping. Texture: the texture was okay, not super fluffy that I was looking for.